Photo taken at Copalis Beach during a dig series in December by Mark Yuasa. State Fish and Wildlife has decided to end coastal razor clam digging on three beaches for the rest of this spring although Mocrocks remains on life support if it passes additional marine toxin testing. Test results on razor clams gathered from Long Beach and Twin Harbors found domoic acid levels have exceeded the 20 parts per million action level set by state Department of Health. Ayres indicates the most recent toxin tests mean razor clams won’t be safe to eat for the remainder of this month at Long Beach or Twin Harbors. Domoic acid, a natural toxin produced by certain types of marine algae, can be harmful or even fatal if consumed in sufficient quantities. While toxin levels remain low at Copalis Beach it has reached the allowable seasonal harvest levels. The recent testing showed levels of marine toxin levels at Mocrocks were just under the action level, so one more round of testing is needed before any decision can be made. “We will dig on Monday, and once we get the results turned around that will tell us what were able to do,” Ayres said. State fisheries plans to make an announcement soon after. Beaches are commonly closed by the end of this month when clams begin to spawn. 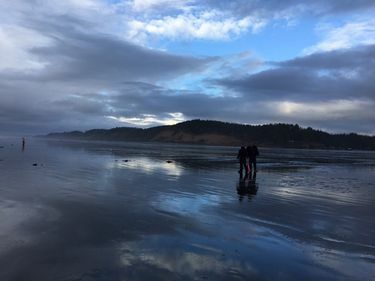 Turnout during the most recent digs on April 26 to May 1 was way up, and digging success was fairly good with 101,179 digger trips coast-wide taking home 1,916,667 razor clams. The 17,784 diggers on Sunday (April 30) at Long Beach on the southern coast was a record breaker and the previous high was in around 13,000 on a single day. The 9,305 diggers at Mocrocks on Saturday (April 29), which is a much smaller beach compared to Long Beach broke a record turnout. The previous all-time high was 8,200. From April 25-May 1, 59,550 diggers at Long Beach had 1,294,386 clams for 21.7 average (the first 25 clams dug at Long Beach only, elsewhere the limit is 15 clams daily regardless of size or condition is a daily limit); from April 26-30, 12,614 at Twin Harbors had 188,751 for 15.0; on April 28 and 30, 16,956 at Copalis had 254,338 for 15.0; and on April 27 and 29, 12,058 at Mocrocks had 179,192 for 14.9. A breakdown on day-by-day success at Long Beach was 23.3 on April 26, 25.0 on April 27, 24.2 on April 28, 24.2 on April 29, 15.5 on April 30 and 25.0 on May 1. At Twin Harbors it was 15.0 on April 26, 14.9 on April 27, 14.8 on April 28, 15.0 on April 29 and 15.0 on April 30. At Copalis it was 15.0 on April 28 and 30; and at Mocrocks it was 15.0 on April 27 and 14.8 on April 29. The total since the season began on Oct. 14 showed 274,173 diggers coast-wide with 4,056,441 clams. A breakdown is 77,778 at Long Beach with 1,555,113 clams for 20.0 clam per person average; 62,893 at Twin Harbors with 834,086 for 13.3; 82,108 at Copalis with 1,040,193 for 12.7; 57,958 at Mocrocks with 686,628 for 11.8; and 637 at Kalaloch with 1,410 for 2.2. State Fish and Wildlife will conduct stock assessment work during the summer, and will plan dates sometime in September for the fall digging season.